South African Vehicle Certificate of registration, Cars Papers. What is a Motor Vehicle certificate of registration? In a nut shell, the Natis motor vehicle registration certificate is an official watermarked document that ultimately proves ownership of a vehicle. Its a physical document containing information that has been logged by the Natis, the data on the certificate of registration corresponds to the information recorded by the traffic department. The document is unique, the certificate cannot be cloned. It can be photocopied and some shady character can probably attempt to fool you and I but they will fail miserably. Even if a duplicate of the cars papers is re-issued at the traffic department it will never be the same as the original, No two vehicle registration certificates are the same. We explain this further on. The certificate of registration is also referred to as the "Cars Papers" the "Title Deed" and "the Log Book"
The Natis certificate of registration has changed a few times over the last few decades. At the moment and for quite some time, every traffic department in South Africa has adopted a greenish themed document that is supplied by the department of transport. The Motor vehicle registering authority only prints the information on the page, the theme and watermark is already on the paper before it is inserted to the printer. To prevent fraud and to protect ownership of a vehicle, besides the watermark and the distinctive theme, the fonts used to print the information is unique and not freely available. In some cases, the fonts may change on almost unnoticeable areas. Even though we have nationally implemented the same system and adopted the same substrate as the official form, this was not the case in the past, just as number plates differ from province to province, certain provinces issued different certificates and they were not identical at the same time. As a matter of fact, even to this day certain registration procedures differ depending on the province you are in. 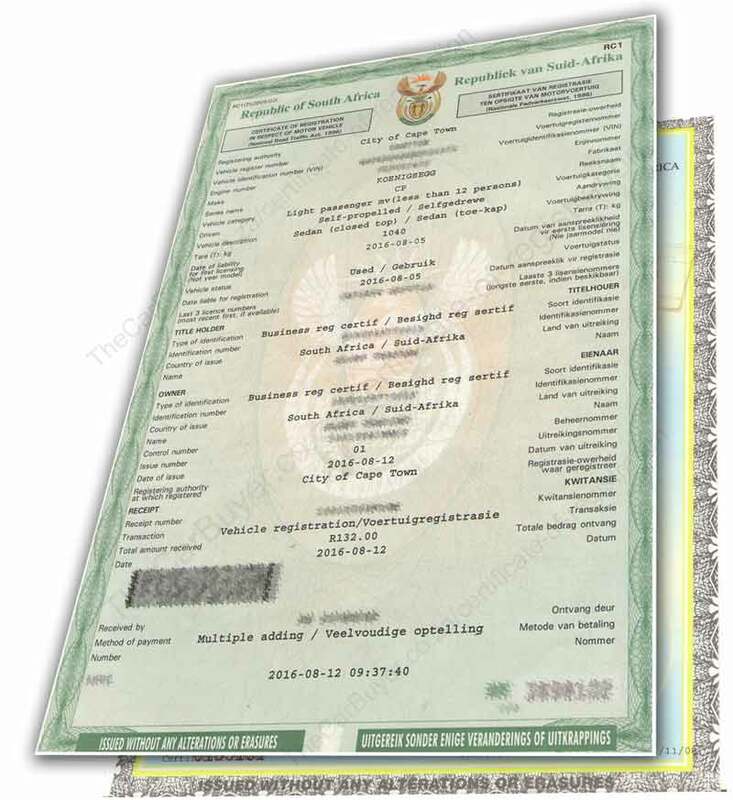 Every once in a while we come across an older version of the registration document, When you are selling or buying a car, Its not advisable to accept any previous version of the certificate especially if there isnt a control number, we'll see if we can address this further on. The contents of a certificate of registration. Register number: Not to be confused with the license number. If the VIN number doesn’t correspond to the log book then you have trouble. The VIN number is cross checked on several transactions. If you intend buying a vehicle, be a safe and weary buyer, ALWAYS check the VIN number, if it doesn’t correspond walk away… FAST! Engine number, this is also determined by the manufacturer of the engine. The engine number on the certificate will correspond to an engraved or stamped number on the sub assembly of the engine and like the VIN number, it is cross checked to the cars papers on certain transactions. The engine number of a vehicle can change, if the sub-assembly is change the necessary procedures should be followed so the new number corresponds to the natis system, the certificate of registration and the license disk. Tare: the tare weight of the vehicle, the cost of your vehicles license is determined by the tare weight. Date liable for registration: This is the date that you took ownership of the car, its is usually determined by the date on the settlement letter, on the notification of change of ownership or the receipt from the seller. Last license: This will list the last 3 license numbers that was recorded on the system for the vehicle. It is important to note that it may or may not contain the current license number. It will list the last 3 license numbers since this certificate of registration was printed. If you purchase a vehicle and the vehicle is issued a new number plate, the new license number will not show on this certificate of registration until the vehicle is sold and registered again, or you apply for a duplicate certificate. An explanation of this: a license number is assigned on licensing and not on registration. When you register a vehicle onto your name, you usually license it at the same time. Although this may seem like one transaction, technically the certificate of registration was created before the license even though its mere seconds apart. When the certificate of registration was printed, at that very second the system had not yet recorded the new license number. Title Holder, The title holder is the legal owner of the vehicle. The title holder possesses higher authority over the vehicle than the owner. Country of issue. Where the supplied form of identity was issued. Country of issue Same as above. Control number, this is one of the most important numbers on this document, it’s a unique identifier for this specific document. Along with the water mark on the certificate and the unique font, the control number makes it impossible to fraud a certificate of registration and get away with it. When you submit a certificate of registration for any transaction, this control number is verified. It is the control number on the certificate of registration that authenticates the validity of a document, think about it in the case where you lose your certificate of registration; you apply for a duplicate and find the original later. The original document becomes void and it’s the control number that differentiates the two. Issue number: This code is used be eNatis to record the transaction that was used to print the document. I have not confirmed this, but at first glance it seems that 01 identifies a straight forward Vehicle Registration and 02 interprets as a request for a duplicate certificate of registration. Date of issue. The date the document was printed or issued. Receipt number: A unique identifier for the transaction and the cost thereof. Even in the case of multiple adding, each transaction will have its own receipt number. You will notice that the teller will add the total of a multiple transaction even though you make one payment, because every transaction is recorded and charged for separately. This is part of the reason why the license number may or may not reflect on the certificate of registration as discussed above. Total amount received. Cost of this transaction in South African Rands ZAR. Date: The date of receipt, usually the same as the date of issue. I cant recall the date of transaction and the date of receipt being different. Method of payment: Single or multiple payment, if you registered and licensed a vehicle it will show as multiple adding, if you request a duplicated certificate or if you only register as the title holder in the case where you’ve settled the vehicle, this was show single transaction. The exact date and time the document was printed, this is very helpful in determining the validity of the document, at The Car Buyer we used the date and time amongst other things to check the validity of a document before we buy a car. If the Natis system records a certificate of registration that was issued after this time, then we know we have the incorrect version. The South African Vehicle Certificate of Registration is a crucial document that should be protected, the departments in charge have done an excellent job in maintaining the integrity of the system in place that protects the ownership of vehicles for South African citizens. Who supplied the original blank document. The ink and or methods used to watermark the certificate. Which registering authority received this batch of certificates for distribution. What makes the certificate of registration unique?